Banish clutter in style! This generously proportioned, French Country inspired bookcase puts everything in its right place with adjustable top and bottom shelves. 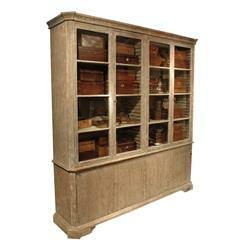 Finished in a grey wash, this neutral hued beauty is a perfect addition to French Country and Gustavian inspired spaces. This item is made to order, please allow up to 4 months for production.